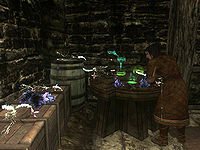 Help Ingun restock Elgrim's rare ingredients. Gather 20 Deathbells, 20 Nirnroot, and 20 Nightshade. Ingun Black-Briar has fallen far from the Black-Briar tree. Instead of learning the family business with her brother, Sibbi, she can be found devising alchemical recipes in Elgrim's Elixirs. The quality of her experiments seem to indicate a dark nature in this well-to-do girl, as she will allude to when speaking to her. Indeed, the ingredients she has depleted from Elgrim's stores are used to make some very powerful poisons. Whether you speak to Ingun in Elgrim's Elixirs or find her walking through Riften, rouse her from her musings and ask her if she is an alchemist. She will reply: "I'm aspiring to earn that title, yes. However, the road ahead is paved with loose cobbles and deadly pitfalls. Master Elgrim says I'm a natural; that I have a unique talent. But I fear his approval masks his intolerance for my mistakes. My errant formulas have cost Master Elgrim a fortune in ingredients; some of which are almost irreplaceable." You are a helpful sort, so ask: "What sort of ingredients do you need?" Ingun will tell you: "To restore Master Elgrim's supply I would need 20 deathbell, 20 nightshade and 20 nirnroot. Am I sensing that you may be interested in gathering these rare ingredients for me?" Answer in the affirmative. Ingun will be pleased: "That means more time for my experiments and less time in the field. Much appreciated." Ingun needs you to hunt down 20 Deathbells, 20 Nirnroot, and 20 Nightshade. Grows in the salt marshes of Hjaalmarch and Haafingar, including a number of specimens in both Morthal and Solitude. Planted specimens can be found in the Honeyside and Alchemist's Shack gardens, as well as Shalidor's Maze in Labyrinthian. There are also quite a few plants growing near each city's Hall of the Dead or graveyard. Grows near water anywhere. Sarethi Farm and Evergreen Grove have two notable clutches. Also on the shoreline and islands north of Solitude, anywhere from 6-9 plants. Make sure to go during the night as they give off light and are easy to find then (as well as a distinct mid-high pitch tone). If Dragonborn is installed, you can find several samples around the coast of Solstheim, especially in the northeast. Grows in places of death. Check the cemeteries at Riften, Falkreath, and Solitude. Also, Hamvir's Rest has quite a few Nightshade, and there are four just outside the Dark Brotherhood Sanctuary west of Falkreath. If you have the Dawnguard add-on, you can find several samples in Volkihar Keep and Volkihar Courtyard. Ingun will reward you with leveled amount of gold (listed in the table below) for each set of ingredients brought to her. After you have delivered and been paid for all three samples, it will behoove you to see what else you can procure from her. Hint to her: "That was the last of the ingredients." To which she will reply: "Yes, Master Elgrim will be pleased I've restored his stock of these rare ingredients. I feel I owe a bit more than some meaningless coin for all your diligence. Here, this key unlocks my supply chest at Elgrim's Elixirs. Feel free to take what you need from time to time. I'll be refilling it once every few days or so." The chest is found in the back of Elgrim's Elixirs, and she will restock it with 2 - 5 random leveled potions every few days. It is possible to give the items to Ingun Black-Briar then quickly exit out of the conversation and enter the item menu then drop the items. The quest log will show "Find 20 <item name> for Ingun Black-Briar (0/20)". However as soon as Ingun is told "That was the last of the ingredients" the quest will update accordingly. The following empty quest stages were omitted from the table: 10, 30, 40, 50, 200, 250. On the PC, it is possible to use the console to advance through the quest by entering setstage FreeformRiften04 stage, where stage is the number of the stage you wish to complete. It is not possible to un-complete (i.e. go back) quest stages, but it is possible to clear all stages of the quest using resetquest FreeformRiften04.